I’ll bet one of the reasons you don’t do resistance training or weightlifting is that you’re scared of it. You might not be afraid of the weights themselves, or even the gym, but rather the environment the gym creates. This can be especially true for people over 50. It can be embarrassing to walk into a gym and have no idea what you’re doing. And your strength level can be a source of embarrassment, too. But to get the results from weightlifting, you don’t need to lift heavy. In fact, strength training with light weights can produce the same results for muscle growth and hormone stimulation that heavy weights do. 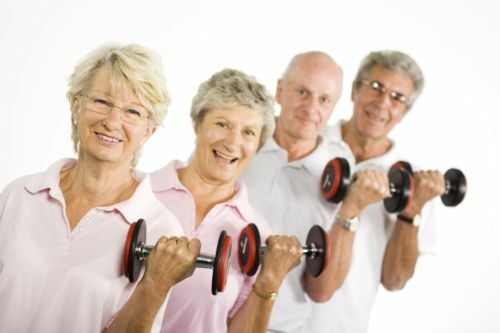 Resistance training is essential for optimal health at all stages of life. It helps fight diabetes, high blood pressure, heart disease, and depression, promotes a healthy weight, and, most importantly, keeps your body strong to protect it from injury. This is essential for older adults. Most exercise programs aim to build muscle and strength by operating on the idea that working muscles in the 80% capacity range is the best for gains. This means that completing 8-10 repetitions is ideal for each set. But this can make people uncomfortable, because the weight is still rather heavy. Although is an extremely effective method, using lighter weights that cause the muscle to operate at 50% capacity is just as effective. The difference only lies in the repetitions required to stimulate strength and growth. Brand-new research has shown that performing 25 repetitions of a movement at 50% capacity will provide the same muscle growth and strength gains as performing 8-10 reps at 80% capacity. This means you can lift lighter weights without worrying about the risks of heavy weights and without being embarrassed about your strength at the gym. It also makes it much easier to work out at home. The key to working out with lighter weights successfully is tiring out the muscle. So when you perform your 25 reps, you want to make sure the muscle is completely fatigued and that you rest for a minute or so before your next set. It’s a similar principle to lifting heavy; you’re just performing more repetitions to tire the muscle and elicit the proper response for muscle strength and growth. So whether you’re working with a weight that causes fatigue after eight reps or 25, the result is the same: the muscle is tired and responds accordingly. So if you’ve been delaying a gym membership or weight training because you thought you couldn’t lift heavy enough for any benefit, think again. You can build quality muscle effectively using lighter weights that reduce your risk of injury and work wonders in building your confidence. Morton, R., “Neither load nor systemic hormones determine resistance training-mediated hypertrophy or strength gains in resistance-trained young men,” Journal of Applied Physiology, May 12, 2016; DOI: 10.1152/japplphysiol.00154.2016.